Day three has ended here at the Rio All Suites Hotel and Casino with Max Steinberg being crowned champion of Event 33: No Limit Hold’em. Steinberg bested 2,779 other players and walks away with $440,238. 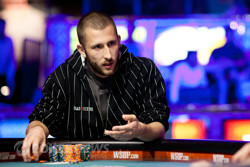 Steinberg will also receive his first World Series of Poker bracelet. Fourteen people came in today with the aspirations of winning poker’s top prize. The afternoon went quickly with players being eliminated right in the first level of the day. With the elimination of Vincent van der Fluit and Mikhail Timoshin who were each at different tables, but got eliminated at the same time as each other we went straight to our official nine-handed final table. Once the final table was reached the action stayed at the same fast pace with Christopher Shaw being eliminated 20 minutes into the final table. Soon play slowed down though with the majority of preflop raises stealing the blinds and antes. Eventually though the game sped up and we saw a slew of eliminations; Vitaly Meshcheriakov, Ryan Laplante, David Nicholson, and Joseph Marzicola all dropped off. After some more intense game play Dylan Hortin was knocked-out. The former chip leader continued his aggression and ultimately paid the price for it . Then it was down to the final three. Matt Stout, Steinberg, and Samuel Gerber. Matt Stout was the first to leave after having a yo-yo of a day finishing in third. The two remaining players both knew what it was like to be where they were. Both Steinberg and Gerber have been runner ups in WSOP events, and both players did it in the same year. Heads up play began with both players fairly even in chips, but a couple of hands put Steinberg in front, and he was able to ride that all the way to victory. Steinberg didn’t just win the bracelet, he earned it by making great calls, coming back from being down, and just playing great poker in general. 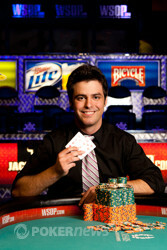 Congratulations to Max Steinberg on winning his first WSOP bracelet. In what would be the final hand of the tournament, Max Steinberg limped from the button and Samuel Gerber checked his option from the big. The flop came and Gerber checked to Steinberg, who bet 100,000. Gerber immediately moved all-in for his last 1.7 million and Steinberg deliberated a while, but eventually made the call. Gerber looked clearly dejected to see he was drawing to just two outs, as a four and a four only would allow Gerber to survive. It wasn't meant to be, however, as the turn and river bricked out for Gerber and he was eliminated in 2nd place. Max Steinberg has slowly been grinding Samuel Gerber down since the last posted hand, however, Gerber was able to find a small rush to get some chips back. 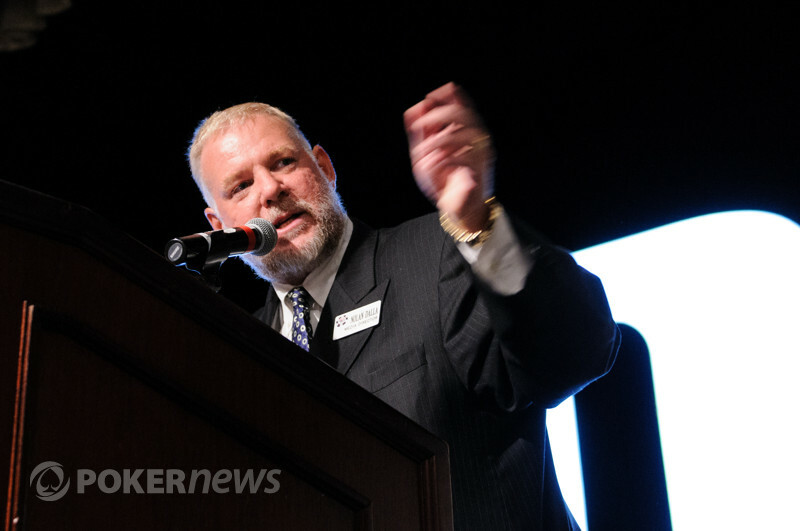 In the first hand, Steinberg raised to 225,000 and Gerber re-raised all in for his last 1.7 million. Steinberg folded and Gerber scooped the pot. In the very next hand, Gerber open-shoved all in and Steinberg mucked. In the third hand, Steinberg again raised to 225,000, Gerber went back over the top all in and Steinberg folded. Gerber still has a long way to go, however, as Steinberg still has more than a 2-1 chip advantage over him. Max Steinberg raised it up to 225,000 from the button and received a call from Samuel Gerber in the big blind. The flop came and Gerber check-called a bet of 250,000 from Steinberg. The on the turn lead to both players knuckling. The on the river saw Gerber fire out 375,000. Steinberg then took his time before making a raise of 1,065,000. Steinber got out of his chair in distress, sat back down and made the call. Steinberg flipped over for two pair sixes and threes. Gerber mucked and Steinber took down the substantial pot. Heads-up play has been surprisingly clockwork since break ended. Almost every single hand has consisted of the player on the button raising to 225,000 and the player in the big blind folding. Stay tuned - something noteworthy is bound to happen eventually. Players are now on another 20 minute break. Max Steinberg raised it up to 175,000 from the button and received a call from Samuel Gerber in the big blind. The flop came and Gerber checked. Steinberg opted to bet 200,000 and quickly found himself being raised by Gerber who mandated 500,000. A few moments passed before Steinberg put out a three-bet of 1,000,000. Gerber eventually folded after thinking it through a little bit. The action has been slow since heads up began. Both players are clearly picking their spots before committing too many chips. However, with the blinds set to rise again in just a few minutes - it is only a matter of time before the action picks up.